Scheck received the Contractor Award for Meritorious Safety Performance for achieving a total recordable incidence rate of “Zero” for 101,533 hours at the Trainer Refinery of Monroe Energy. The award, presented by the American Fuel & Petrochemical Manufacturers, recognizes contractors working a minimum of 20,000 hours per calendar year that achieved a total recordable incidence rate of 0.6 orless with no workplace fatality during 2014. Scheck was also awarded the 2014 Meritorious Performance Award from the Three Rivers Manufacturers’ Association member companies and the TRMA board of directors. The award recognized Scheck’s record for working without a recordable injury in 2014 for work done at the ExxonMobil plant in Channahon. A first ever “Diamond award” was issued directly from the ExxonMobil refinery manager. In addition to the Diamond award, Scheck also received the “Gold Award” and “Merit Award”. Scheck Industrial Corporation was awarded a Certificate of Safety Excellence by the Wisconsin Department of Workforce Development and the Wisconsin Safety Council in recognition of its exceptional commitment to safety in achieving a perfect 2014 incidence rate. Finally, Scheck also congratulates Scott Beakes, corporate safety director for the East Coast Division of Scheck Mechanical, who recently received board certification as a Construction Health and Safety Technician. 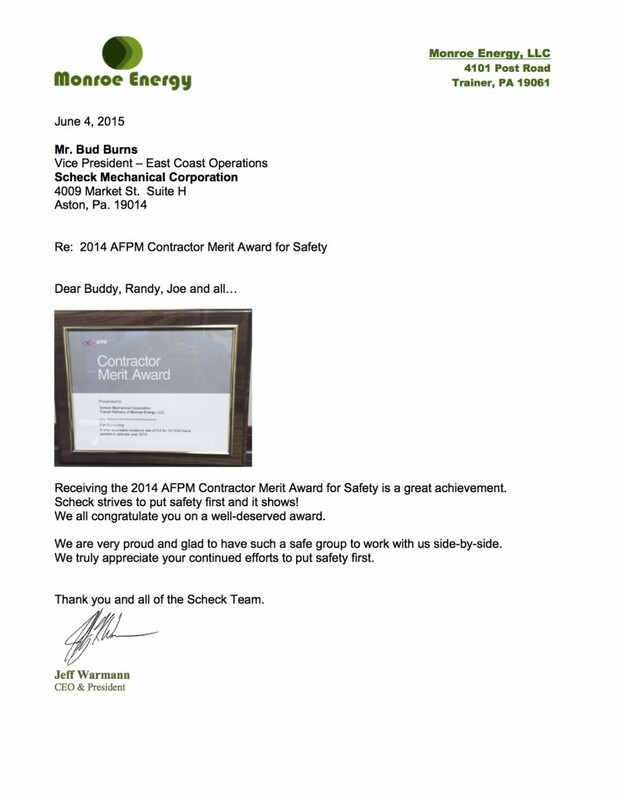 These awards and certifications are a nod to the record-breaking safety recognition Scheck continues to build. We have recently surpassed a safety milestone of seven million craft hours in the field without a lost-time injury in seven years. While we have a lucky seven on our side, luck has little to do with it. Scheck’s reputation as a safety standard bearer in the specialty construction industry has been achieved by its leaders and crews working together.